Socialist figurehead Nicolas Maduro, who has been in power since the 2013 death of former president Hugo Chavez, supposedly won 67.8 percent of the vote in last May’s presidential election. However, neighboring countries such as the United States and Brazil swiftly condemned the electoral process as rigged and fraudulent. 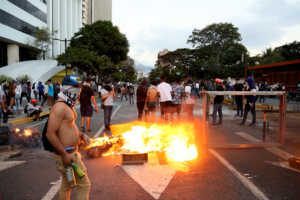 Following mass demonstrations Wednesday, young opposition leader Juan Guaido, who is the head of the National Assembly, has now declared himself the interim president of the stricken country. Why has the economy collapsed? Public health is in a horrific state. There are grave shortages of basic medicines and hospitals are “like something from the 19th century,” one surgeon, Dr. Christian Pino, told The New York Times from his hospital in the city of Merida. According to Reuters, the International Monetary Fund is predicting that the Venezuelan inflation could reach as much as 10 million percent this year. What is the U.S. position on the political crisis? On Wednesday, President Donald Trump declared his support for opposition leader Juan Guaido. Soon afterward, Canada, Brazil, Colombia, Chile, Peru, Ecuador, Argentina, Paraguay and Costa Rica all announced their intention to back the opposition leader.